I entered a position in UNG (nat.gas). 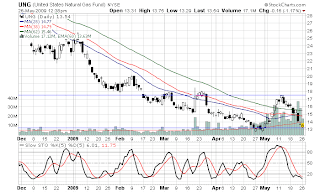 It is pretty oversold, and just about sittin on its low end support. If GDP will become positive, as many economist are saying, by year end, the use of Nat Gas will increase and now is the time to enter the position. I am playing for the pop back to 17-18 or so.